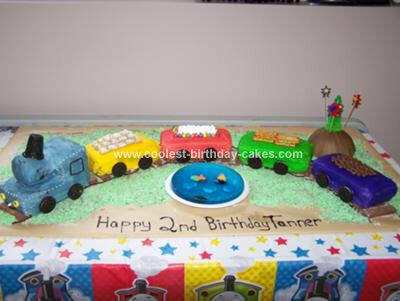 My 2 year old boy is obsessed with trains, so naturally, I started searching for train cakes. I found many pictures on this site that I liked and made my own version of a Train Birthday Cake. I started with a 4ftX6ft sheet of coroplast board for the base. I laid out the cakes to measure out the track – rope licorice and chocolate wafer cookies. I “glued” it down with icing. Next, I mixed water and icing sugar (quite runny) to glue down the grass which was coconut colored with green food coloring. I baked the cakes a week before (when I had the time) and froze them. Take one cake out at a time to ice it frozen, this makes it easier to ice (no crumbs) and it keeps the cake very moist. We had 16 adults and 8 kids, so the mini loaves that everybody else used would not be enough for me, so I used normal sized bread/loaf pans. For the engine, I used one loaf for the base and a second loaf to cut up and use for the topper and stack. I placed the cake on top of an upside down loaf pan to make it easier to ice, turn around and to lift off once I was done. I used the bottom half of a flat ice cream cone, covered it in black icing and put black sugar sprinkles on it. I tried to put cotton candy for the steam, but could not get it to stay properly, nobody noticed! One by one, I decorated the cars and “held” them together with rope licorice. The hill in the background was an extra for a “nut allergy” guest so I topped it with a tree -an ice cream cone covered in icing using a piping bag. My little guy also loves fish, so I made him a lake using 1 pkg blue raspberry jello and 2 pkg of unflavored gelatin to give it extra strength to hold together. I made it in a greased pie plate and only added enough water to get the desired depth. I put in some gummy fish and blue whale candies, but I should have waited until that morning, as the candies went soft and gooey. Also, not thinking that jello gets watery and melts a bit – I had to put it on a Styrofoam plate. If I had time, I would have added more sand or grass around the lake, but that didn’t happen! It took me almost 5 hours to complete everything, but it was all worth it and I can’t wait until his next birthday! !